Perhaps too great. The chorus demands “Warning, live without warning”. This is social commentary on an over-sexed, fearful, suburban, anti-bacterial obsessed nation at the turn of a century. The next track of any social import is “Fashion Victim,” track four. This song is a non-gender-specific testament to a new, fashion-fueled youth. The lyrics employ a witty play on political terms, such as genocide, to illustrate a youth culture plagued and pestered by the media to conform and adhere to a dress code. This song is about selling yourself to the media and becoming a sheep. Or rather, not succumbing to social or popular norms. Youth are expected to buy name brand products and starve themselves thin in order to fit in with their peers. This song asks: “What’s in a name”? The answer: nothing. Be yourself. Do not conform. Now, we’re going to skip over to the last two tracks on the album: “Minority,” track eleven, states in plain terms its message. This alternative Pledge of Allegiance is potentially offensive, not only politically, but religiously (one nation under dog). This song is a slap in the face to any conservative American citizen, and a powerful youth anthem for the ages. It gives power to young people by making them feel like an individual in a herd, so to speak. It allows them to take solace in being a “minority”. Finally, track 12, “Macy’s Day Parade.” This song makes me think of the end of an era. If you have ever listed to Green Day’s 2004 release, American Idiot, it almost sounds like a smooth transition from one set of ideals, to the next, better thought out, level. The song addresses and rejects commercialism by playing on common practices associated with death. Then consumer values are challenged by equating what we want with what we really need, and defining those values with common terms used in advertising. In the end, no matter what we’re talked into buying by the media-machine, we as a people are still not happy because what we really need is hope and a restored faith in humanity. The most interesting part about Warning is that it was released in a pre-9/11 world. Either it is a little prophetic, or the members of Green Day have pretty good insight into social and political trends. Not only that, but they want to do something about it. 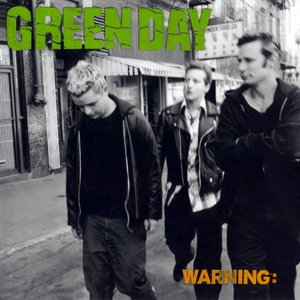 Warning characterizes the beginning of Green Day’s more straightforward political message in a subtle way. From there, they have only made more impactful loud and socially relevant music, especially in the United States.